CONTENTS ... LINKS to all forts photos from 1999, 2003, 2004 and 2005 ... Click Here! Aerial photos of the Forts in September 2003 ... Click Here! All photos on this page were taken by Dave Roberts on 28th September 2003 from the PS "Waverley". Roughs Tower Fire (Sealand) news and photos ... 23rd June 2006 .. Now updated and with four pages of photos! Recent Thames Forts Photos on other websites ... LINKS below. R.I.P. REM Island aka Noordwijk Platform. September 2006! Red Sands forts. Shivering Sands can be seen on the horizon. Part of King Radio/Radio Invicta/Radio 390 complex at Red Sands. Shivering Sands fort. Home of Radio Sutch and Radio City. Maunsell Sea Forts in the Thames Estuary : During the Second World War several sea forts were built and positioned in the Thames Estuary. Designed by Guy Maunsell and built for the Navy and the Army the structures helped defend the Thames against any hostilities. The forts were abandoned in the late 1950's until re-inhabited once again and used by the offshore radio stations from 1964 to 1967. This was an all too brief period of frenzied activity and listening to the radio became an essential part of teenage life. We listened to the pirate ships and the even more interesting (if not alway as slick) sounds emanating from the newly occupied sea forts at Knock John, Sunk Head (alas, blown up in 1967), Red Sands and Shivering Sands. Stations like Radio Sutch, Radio Essex, BBMS, Radio City, KING, Invicta, Radio 390, Tower Radio & Tower TV all added to the radio waves beaming into London & the South East! 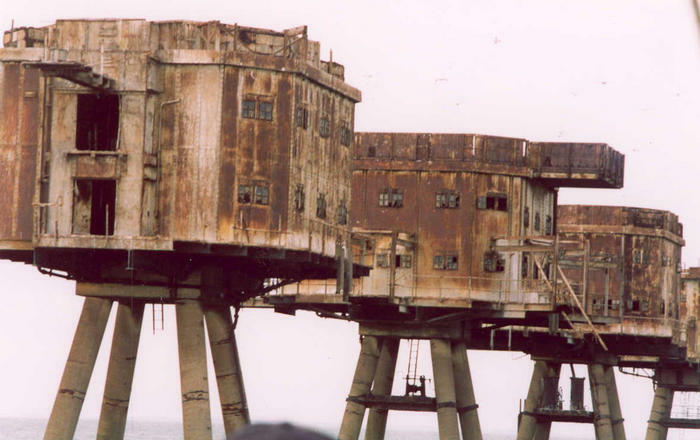 This website is a photographic record of my visits (in 1999, 2003, 2004 and 2005) to some of the sea forts that were used by these radio stations. "Project Redsand" is currently underway in an attempt to save at least one set of towers. The only complete set of seven towers is at Red Sands. Preserving these forts is an ambitious and costly thing to do and we can only hope something can be saved for posterity. They were built to last, although they look a little weather beaten when viewed close up these days. Anyone visiting the forts today is in for an absorbing and I think slightly eerie experience. Go visit them before it is too late ...as one day they could be gone. I hope you enjoy the photos and decide to explore the Thames and go out to see the Radio Forts. They are out there! 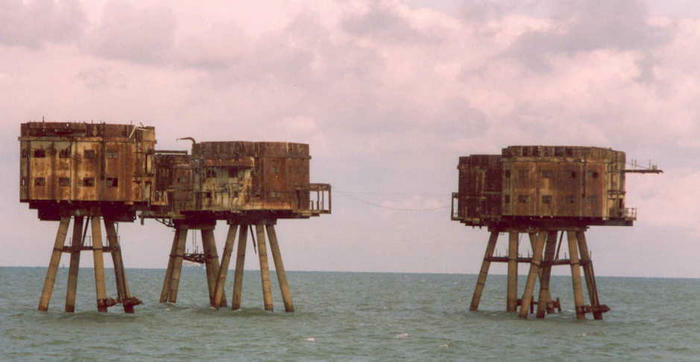 The history of all of the Maunsell Sea Forts including their brief spell as offshore "pirate" radio stations is fascinating and covered on many other websites. Frank Turner (the Military Historian) has written the definitive detailed history of the Maunsell towers as well as published some excellent booklets and these can be purchased via the Bob Le-Roi and Project Redsand websites (see links) or the full range of publications can be bought direct from Frank R. Turner , Glendale House , Marling Cross , Gravesend , Kent , DA12 5UE. For a very brief history of these forts including photo's please click on the links in the left panel OR on "SITE MAP LINKS". Photos of the forts in 1999, 2003, 2004 and 2005 can be accessed via the CONTENTS ... SITE MAP LINKS page ... click here! Have you ever wondered what those strange structures are on the horizon? Red Sands towers with Shivering Sands towers in the background as seen from Minster on the Isle of Sheppey in 2005! (Photo by Graham Bartlett). Click image to see the Radio Forts CONTENTS ...Sitemap page with LINKS to other pages on this site. This site will no longer be maintained on any regular basis as from 1st November 2006 due to personal commitments. However I do have lots of new material to add in the future if I can. Apologies to all those kind people who granted permission to use their brilliant photos of the forts in recent times. Hopefully I will get time to add them by the end of 2006! Thanks to all viewers of this site and I wish you all good things in the future. Dave R.
Unless stated otherwise, photos on this site are the copyright of Dave Roberts, and were taken from the "PS Waverley" on the dates shown. Please feel free to use these images. However I would like an email to let me know where the image will be used and please mention this website as the source. Many thanks. Please contact us with any comments or contributions.